Is Lenny Kravitz the new Velvet Revolver frontman? 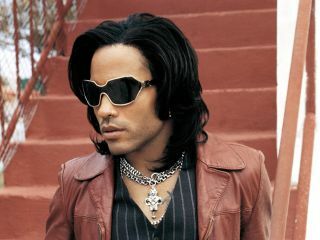 Lenny Kravitz. No, we've no idea what the hell is going on with his hair here either. Lenny Kravitz is set to be unveiled as the new Velvet Revolver frontman any day now, according to UK tabloid reports. After coming close to choosing former Spacehog singer Royston Langdon and being linked with virtually every unemployed singer in Christendom, have Slash, Duff and the boys finally found a replacement for Scott Weiland? According to The Sun newspaper, Lenny Kravitz has been "spotted in the studio" with Velvet Revolver. In true tabloid style, the story quotes an anonymous 'source' as commenting: "The band wanted a big name who could easily hold his own and reckon Lenny is just the man for the job." Given Kravitz's multi-instrumental prowess, he's certainly more than up to the job, and he has collaborated with Slash before. The then Guns N' Roses guitarist appeared on Kravitz's 1991 album Mama Said, co-writing and playing on the song Always On The Run and adding guitar to Fields Of Joy. It remains to be seen whether this is will amount to anything more than a rumour, but if Lenny does jump onboard, he might just bring a little groove to an otherwise rather straight-ahead hard rock band.